These are beautiful glimmering shirts or dresses, available in roomy sizes Large up to 9x (check measurements below). In 5 beautiful colors; black glimmer, charcoal glimmer, white glimmer, charcoal purple glimmer, dark olive green glimmer, dark purple glimmer, plain red, plain black, plain purple, light pink glimmer, or hot fuschia pink glimmer. 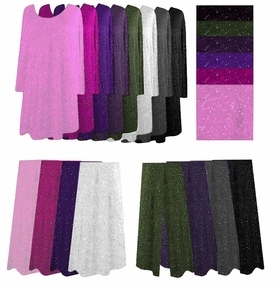 Order Matching Pants or Skirts!